The strongest trade winds have driven more of the heat from global warming into the oceans; but when those winds slow, that heat will rapidly return to the atmosphere causing an abrupt rise in global average temperatures. 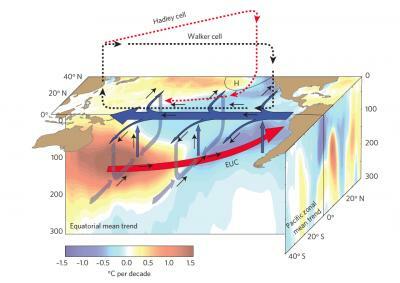 “The winds lead to extra ocean heat uptake, which stalled warming of the atmosphere. Accounting for this wind intensification in model projections produces a hiatus in global warming that is in striking agreement with observations,” Prof England said. March 25, 2019 - Experts reveal that clouds have moderated warming triggered by climate change Phys.orgA new study has revealed how clouds are modifying the warming created by human-caused climate change in some parts of the world. March 21, 2019 - Harvard scientists want to limit how much sunlight reaches Earth's surface in order to curb global warming Business InsiderResearchers at Harvard are proposing a solution to climate change that sounds almost too simple to be true — they want to block some sunlight.